For very occasional random news on the sangha. Go to What's New for more up to date material. 10-12-07 - Tomorrow there is a Celebration of Life Memorial for Niels Holm at 2PM at the Palindrome in Port Townsend, Washington. There will be a ceremony, potluck, and music. A photo of Mark Petchey standing with his parents, Grahame Petchey and Hideko and a new Mark Petchey page. 10-04-07 - On the Niels Holm Memorial Page - His partner O'Neill and a friend write - and three great Photos. 10-01-07 - 1. Karl Renz will be in the Bay Area (Mountain View, San Francisco, San Rafael) October 3-7 (see the schedule) Read Andrew Main's informative message about this Advaita-like independent teacher - with links and quotes. 2. Only four more days for the Berkeley Zen Center 40th Anniversary Celebration Auction . 9-30-07 - Happy 50th CBA! 9-16-07 - Early sixties Suzuki student, Jeanie Stearns, responds to Early Tassajara Alumni Reunion page by informing us that Philip Wilson died of a heart attack in Los Angeles in July of this year. Phil was the second person that Shunryu Suzuki personally ordained as a priest, the third he sent to the famous Soto Zen training temple, Eiheiji, in Japan. 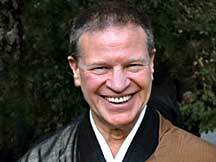 Phil was the second person, after Zentatsu Richard Baker, to be shuso, head monk, at Tassajara, Zen Mt. Center. I have lots more to say and interviews with both Philip and his wife of those days J.J. Wilson which I will go over and post within a week. I'll also be in touch with Jeannie and J.J. Please send your memories of Phil. And photos. 9-11-07 - Niels Holm is not well. 7-11-07 - Andrew Main writes about the photos of Thomas Kelly, one of which might be the one Maggie Kress was admiring when she had her fatal stroke, others on the Aghora of India who practice in graveyards and more. 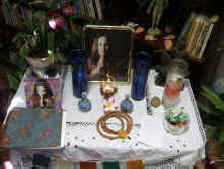 7-05-07 - Photos of Annapurna's Shrine at the Pine Street Clinic in San Anselmo by Rene Pittet. A new Memorial Index - went back over prior posts to remember some who have passed on. Doing that led to Ryuho Yamada in Thank You and OK! Please help to make it as complete as can be. See cuke.com interview with Maggie Kress. 6-26-07 - Read the text of Jack Van Allen's cremation ceremony and some words about Jack from officiating priest Alan Senauke. 6-25-07 - Margaret Kress died last night surrounded by her family. 6-20-07 - Jack Van Allen died last night at 5:18. Annapurna, Georganne Coffee, student of Shunryu Suzuki and Tibetan Buddhism, has gone to the other shore. Gyate gyate. 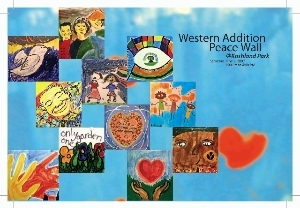 6-08-07 - Western Addition PEACE WALL Unveiling and Celebration in San Francisco tomorrow across the street from the SFZC. Read all about it including Barbara Wenger's invitation to you to come! Go to the BPF web site and sign up to Receive their Monthly E-Newsletter. One just came out today. Dchad Misc comments on this - not on one coming out today but - oh you'll see. 5-31-07 - Go here to learn about Jana Drakka's June 9th Workshop at the SFZC, The Whole Moon In A Puddle - A Training in Total Acceptance, in which "We will be working with a combination of mindfulness meditation and Harm Reduction training." This page also features links to articles and videos about Jana's work with the homeless. 5-09-07 - Reports on a Buddhist Peace Delegation in Colombia, South America co-led by Linda Ruth Cutts and Sarah Weintraub. 4-22-07 - Report on Peter Coyote's lay ordination. 4-17-07 - Check out A Fairly Gossipy Account of Two Events. 4-15-07 - IVA JONES in Cotati, Sonoma County, CA, needs a new car. 4-06-07 Zentatsu Richard Baker seminar. 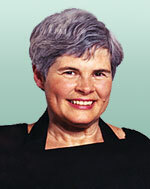 Baker-roshi will teach a seminar in Boulder from May 4-6, 2007. For more on this click on thumbnail which is probably to the left. Here's a link to info on this seminar on the Dharma Sangha web site - that's a link to their home page. Taigen Dan Leighton has moved to Chicago. An article from the Monterey Herald on the purchase of the Horse Pasture parcel of land adjoining Tassajara by the Wilderness Land Trust plus more images from this beautiful, remote 160 acres. 3-17-07 HISTORIC HORSE PASTURE PROTECTED FOR WILDERNESS. 3-2-07 - A Robert-Beck virtual-memorial was created by Natalie Carpenter. At this site, you can read about Robert Beck, post a greeting, share in the guestbook, view a photo album and more. There's more on Bob from the Sangha News 2-26 announcement of his passing. See the cuke interview with Robert Beck. 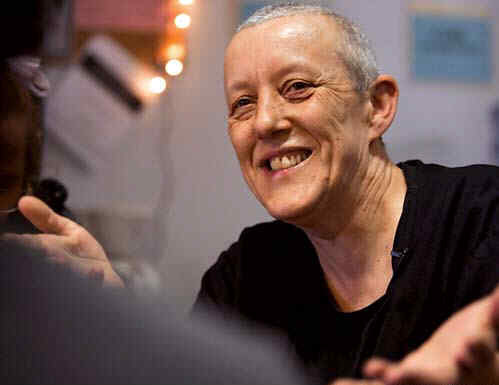 Darlene finally finished her six months chemotherapy regimen this week.. Her doctors had increased the amount of medication given to her the last two times, thus it has taken a bit longer each time to for her to recover from the toxic side effects. She will soon be officially declared in remission. If the cancer does not reoccur in the next five years, she will be "cured." However, since ovarian cancer is an extremely aggressive form of cancer, she will continue with her alternative medicine appointments with Michael Brofman in San Anselmo as well as actively pursuing information regarding clinical trials, new cancer drugs & drugs that are being fast tracked by the FDA. Darlene’s spiritual well being remains intact & healthy. She strongly feels this is due to the consistent caring, support & wishes for well being that are offered up daily by sangha, friends & family. See cuke.com interview with Darlene Cohen which includes links to Darlene's website and more. 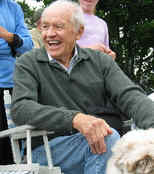 2-26-07 - Robert Beck who, along with his former wife Anna, sold Tassajara Springs to the SFZC, died Saturday evening, February 24, 2007 in a Bay Area veteran's hospital. Bob had been diagnosed with ALS, Lou Gehrig's disease. 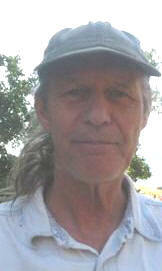 According to an email from Nancy Roscoe, his friend and also once Tassajara owner, " His last day was peaceful. He was coherent, talkative, and cheerful. His last request was for lemon bars and vegetable soup." Saturday, February 24, 3 p.m.
On February 24th Jiko Linda Cutts will complete her seven-year term as Abbess of San Francisco Zen Center at Green Dragon Temple. Sunday, February 25, 3:30 p.m. In this special ceremony, Myogen Steve Stucky will be installed as a new abbot of San Francisco Zen Center. He will join Abbot Ryushin Paul Haller in directing the religious life of the community. The sangha of all three practice centers will come together at SF City Center to welcome the new abbot into the temple. All of the above taken from the SFZC website. Congrats to both of you from the whole gang at cuke.com. More on Steve from his group's website - dharmaeye.org. More on Linda from the abbot's page of the SFZC web site - along with a complete list of prior and present abbots. 9-20-06 - Open Mind Zendo at Burning Man photos and notes. 7-30-06 - Betty Warren died this morning. 5-24-06 - Lou Albert died yesterday. - a message from his son, Ian and a comment by DC. 3-31-06 - Dear friends, As some of you know, Our friend Lou Albert who lived at Green Gulch with Ian one of his two sons and practiced with us at Zen Center for many years has been recovering from and in treatment for cancer. He is feeling better and is trying to sell his art work to help offset recent medical costs. Please take a look at Lou Albert's website (down now - July '07 - there are plans to get it back up) and send it to anyone who may be interested in supporting him. 12-23-05 www.kobun-sama.org - gratefully remembering Kobun Chino. Go to Kobun Chino page. 12-11-05 - Obituary for Bill Wenner by Charles Page. 11-25-05 - It is sad to announce that Dr. Bill Wenner, Tassajara's doctor during the Sixties and early seventies died yesterday in Hawaii at the age of 79 - of prostate cancer. There will be more on Bill including his obituary which Charles Page is working on now. Farewell dear generous and thoughtful friend and condolences to his widow Cynee. Festival of the Arts & Crafts at San Francisco Zen Center/City Center - This Saturday, November 26, 11:30 a.m. to 5 p.m.
Come see, hear, taste, touch and buy photography, paintings, ceramics, meditation clothing, sutra covers, note cards, hand bound family history books, as well as the healing arts, music, drumming, and edible goodies. Come for zazen, lecture, lunch, and SHOPPING! Great gift ideas! Support Zen Center, individual artisans, your loved one, and yourself—All in one event! 10% of all proceeds go to help pay for the recently installed City Center solar power panels. 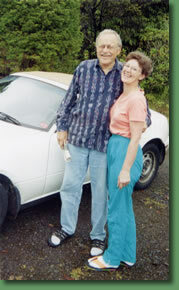 11-21-05 - Our thoughts and prayers go out to our dear friends Bill and Cynee Wenner in Hawaii. Bill was Tassajara's doctor from the Suzuki days whose generosity knew and knows no bounds. Bill is on his deathbed now at home with Cynee by his side. Arnie and Therese report that his spirit is strong though his body weak. 9-18-05 - Who Are the Zen Aluminati? Also there have been other updates in this section not listed here. 8-07-05 - An announcement from Crestone Zen Mt. Center. 8-04-05 - Aluminati update by DC on Ananda and ruminations about the need to enclose the work I do within an Alumni organization outside of the SFZC. 8-02-05 - Thanks to John Steiner for forwarding this article from the NY Times on the recent wedding of Elizabeth Baker, Zentatsu Richard's and Virginia's daughter. 5-06-05 - For friend of Lou Hartman, an Invite to his 90th Birthday Dinner. 4-20-05 It is with great sadness that I report that Michael Wynne died last night. Here is a photo of him and Wendy taken by Gene DeSmidt and a note from Gene. 3-4-5 - See Aluminati Statement and then go to Who Are We Thinking Of? Also, read Eric Arnow's letters from Thailand. 10-06-04 - Go to Back Porch Zendo for an invite to hear Bearing Witness in Columbia , Walking with the Peace Community of San Jose de apartado, a presentation Sarah Weintraub is giving in the Bay Area this month. See the Buddhist Peace Fellowship site announcement of her talk at the SFZC Oct. 1. 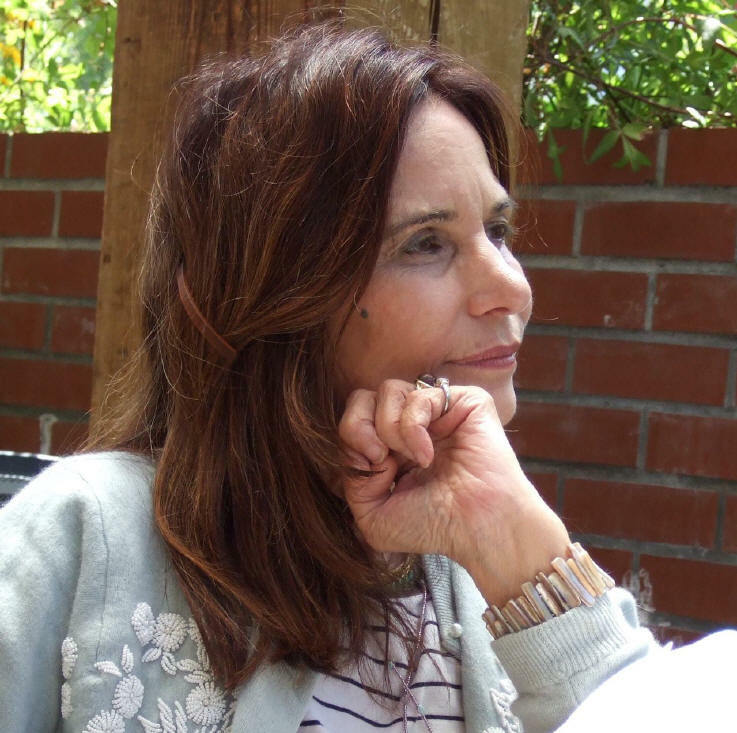 And please go to the article on the BPF site about the massacre in San Jose de Apartado where Sarah Weintraub works with the Fellowship of Reconciliation’s Colombia Peace Presence Project. Sarah is the daughter of SFZC abbess Linda Cutts and Steve Weintraub. Read the interview with Bill Lane. 9-14-04 - Don Allen, editor of the Beats and early advisor to Shunryu Suzuki dies. See Obit NYTimes and Obit AP. Read his interview. 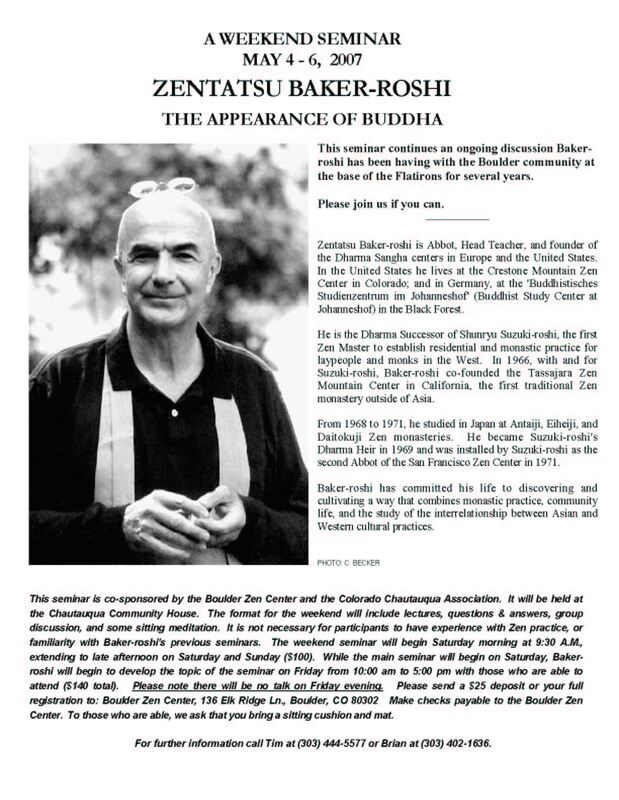 9/06/04 - Check out this notice of a talk to be given next Saturday in Santa Rosa by Suzuki disciple Paul Discoe. 9/05/04 - Go to Shutterfly to see Reuven Ben Yuhmin's 32 fine photos of us old geezers at the Shunryu Suzuki 100th birthday bash at the SF Zen Center's City Center and Green Gulch Farm and at Greens Restaurant last May. 7/20/04 - Buddhist Peace Fellowship notice: BPF Members and Buddhist Activists to Meditate at Democratic and Republican Conventions; Join 275-Mile Peace Walk from Boston to New York. 6/30/04 - An announcement of a Zazen Weekend with a photo of the Crestone Zen Mountain Center Zendo. And a congratulations to Vanja Palmers on the opening of his new zendo - here is the invite in English and German - go on and crash if you're in the area. The zendo is in the Swiss Alps above Lake Lucern. Tell him DC sent you. 5/24/04 - The weekend long 100dth birthday bash for Shunryu Suzuki was terrific. December 10, 2003 - Ryuho Yamada died. 3/10/03 - Selling my house, giving a presentation. Go to today's What's New. See the Kobun Chino page. 1/17/03 - Margot Patterson Doss -- Chronicle columnist on walks for 30 years and early Shunryu Suzuki advisor dies. 9/20/02 - Read an article in today's San Francisco Chronicle [link doesn't work anymore] about the Real-to-Real Film Festival that opens today. Congratulations to Michael Wenger. 9/15/02 - Real-to-Real: Buddhism and Film festival Sept 20-22 at the Castro Theatre in San Francisco. 8/27/02 - PHILIP WHALEN MEMORIAL READING on Friday August 30, 7:00 pm in San Francisco. 8/23/02 - There will be a memorial service for Kobun Chino Roshi at Jikoji near Los Gatos, CA, on Sunday, August 25th, at 11:00 A.M. Jikoji is located off Hgwy 35, 1.8 miles north of Hgwy 9 on Ward Road. Many will attend. 7/26/02 - Kobun Chino and daughter Maya drown in Switzerland. 6/26/02 -Philip Whalen dies at 5:50 AM. See the Whalen Link Page for more. Congratulations to Brian Unger on his ordination to be in January of 2003 - by Norman Fisher in Bellingham, Washington. 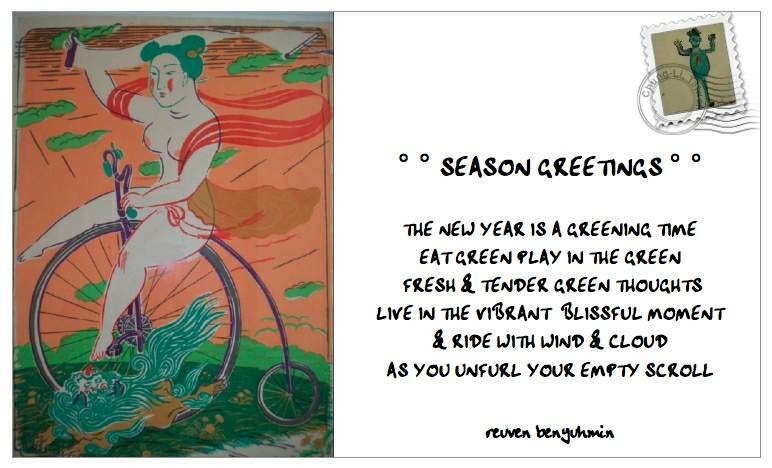 Check out the new Brush Dance free e-cards at www.brushdance.com -- cards with words of Rumi, Thich Nhat Hanh, others. If it seems appropriate, would be great to post on the Sangha News. Thanks for your help with some Suzuki Roshi quotes - We are publishing some "American Zen" cards and a 2001 calendar -- great stuff. I'll send you the cards when printed in early 2000. We are in the process of developing, improving and growing an internet presence. We plan to launch an online catalog, as well as significant content and community for the spiritual/alternative/mind/body/spirit community. 12/8/99--Another update on Mark Petchey's progress from his mother. 11/18/99--A report on Mark Petchey's progress from his mother, Hideko. 11/10/99--from Cathleen Williams, Ino at the City Center, SFZC. We have just heard tonight Grace Shireson in Japan, that Hoitsu Suzuki's wife Chitose-san has breast cancer and is going into the hospital on the 16th for surgery. We will be having well-being ceremonies beginning tomorrow and hope you will further spread the word so that all the sanghas who know her and know of her will join with us in this loving support. 11/04/99--From Jack Van Allen: Regarding the Dogen Symposium: It was inspirational to sit and listen to Alan Senauke's address. I would very much enjoy a work- shop to study the content of his talk. I would love a copy. Excellent! His exposition of the Dharma was very clear and everyone there recognized the fact. I would have given a great deal to see the expression on Sojun's face as he spoke. Three Bows. 10/26/99--Reb going strong at Green Gulch. You may have already heard: Reb had a mild heart attack last Tuesday. He was in dokusan and began to feel increasing chest pains. At first he thought it was a reaction to her story, then he realized it was a physical problem. Then the woman with him thought it was a reaction to her story--thought he was empathizing by saying his heart hurt. Finally she realized what was happening. He was taken to Marin General by ambulance, where he stayed until Thursday afternoon. Angioplasty was performed on one coronary artery, and he was later given a stress test to evaluate his cardiac function. He walked into the dining room for dinner the day he was released, and was in the zendo with the tangaryo group for afternoon service the next day. The symposium Dogen Zen and its Relevance for our Time October 23-24th at Stanford was well attended and well appreciated by hundreds of people. I hope to get some reports and comments on it from alert readers. There was an openness on all sides to a critical look at aspects of Soto Zen as practiced in Japan and the US, and of Dogen's many sides and levels of teaching, of his sublime expression of the first principle with less enthusiasm for all the forms he taught. But there was no doubt about the form of zazen and teaching of the unity of practice and enlightenment.. Still there is a lot of his teaching to come to terms with, what was called "the warts" a few times. This last point was brought up eloquently by Suzuki student and Stanford professor Carl Bielefeldt (who it seems put this symposium together with the Soto-shu). Many of us would like to hear more from Carl anytime. There's actually quite a bit here and there available and let's keep our eyes open for links and the possiblity of posting some of his talks. He wrote a definitive book on Dogen and is known for his early translation of the Mountains and Waters fascicle of the Shobogenzo. Suzuki-roshi was comfortable with and devoted to Dogen's way, but I don't think in the long run he cared much about the particular forms that people used, even if Dogen insisted on this or that. Suzuki always emphasized that forms change, the culture of practice will change. He was for finding the spirit of the teaching and not getting caught by the forms. I see Suzuki as an emissary for Dogen's teaching and spirit. And we all tried to do it as well as he did. But we did used to say "nine clay ball" at Tassajara [see what I wrote about this on pages 119-120 of Thank You and OK!--DC]. Nine clay balls referred to Dogen's toilet paper, his teaching on how monks should use the tosu (obscure Soto word), the john. Nobody does it anymore that I know of. Katagiri-roshi tried it, I hear, when he was a student at Eiheiji. Even though Suzuki-roshi was critical of the state of Soto Zen in Japan and didn't want any control of SFZC by the Soto Shu, still, he wanted real exchange Zenwise between the two countries and there it was. His incredibly ambitious, seemingly ludicrous hope for this cross-fertilization is happening. The relationship between the Dogenettes here and Japan has matured and seems to working toward mutual benefit. It's getting more comfortable. Keep an eye on the web site of the Stanford Center for Buddhist Studies (SCBC) http://www.stanford.edu/group/scbs/ and I'll bet we'll be able to read, listen to or see on video Carl's talk, Blanche Hartman's, Gary Snyder's and all of the other folks. And more. See note of 10/21 below for more info on the conference. After his heart attack early Tuesday morning, and angiogram and angioplasty Tuesday afternoon, Reb had a further "nuclear treadmill" test today [10/21]. The results were such that he was able to be released from Marin General Hospital late this afternoon. When I saw him at the hospital this afternoon (before the tests came back) he was in good spirits and feisty as ever. Certainly further medical observation, etc. will be necessary. I understand that Reb is still planning to give the Green Gulch Sunday morning Dharma Talk this week as previously planned. From Jamie: I read about Reb. I'm sorry he had to go through all that. I hope he makes a speedy recovery. You know, I've been reading and rereading his book [ Warm Smiles from Cold Mountains: A Collection of Talks on Zen Meditation--see Bibliography] for the last several weeks and it really been good for me. I really like his style. He seems to be able to speak right into me, you know? It just resonates from the first reading. Anyway, I really hope he comes back better than ever. I'm rootin' for him! Seems that many from the wide Soto sangha and beyond are converging on the Dogen conference at Stanford on Saturday and Sunday. it's called Dogen Zen and its Relevance for our Time. October 23-24, 9 AM to 5 PM, Kresge Auditorium, Stanford University, CA. In Celebration of the 800th Anniversary of the Birth of Dogen Zenji, 1200-1253, Founder of Soto Zen Buddhism in Japan. Speakers are Sat: Prof. Otani Tetsuo, Prof. Carl Bielefeldt, Blanche Hartman, Okumura Shohaku, Daido John Loori; Sun: Griffith Foulk, Nara Yasuaki, Sojun Mel Weitsman, Hozan Alan Senauke, Gary Snyder. 10/20/99--Tenshin Harold Reb Anderson is doing fine but he had a heart attack yesterday morning at Green Gulch Farm in Marin County. It happened during a dokusan (private instruction). An ambulance was called; he was carried out of the dokusan room and taken to Marin General. He had an angioplasty which was successful. Since it was said that there was a one in three hundred chance that he wouldn't survive the angioplasty, there was a ceremony before the operation. I don't know the details but some priests did some chanting. Anyway, everything worked out fine. There was some blockage found in other arteries that may necessitate further surgery or may not. I hear he may be home to Green Gulch tomorrow. It was obviously a genetic problem. His father had a heart attack at forty-nine and died of heart failure at sixty-two. Knowing Reb, he'll be running in no time. He's possibly in the best shape of anyone at Zen Center and he's one of the most disciplined people I've ever known. Whatever it is that he has to do to take care of himself, he will do. Remember--he was a Golden Gloves champ in Minnesota. Reb came to Zen Center in 1968 and quickly became a close disciple of Suzuki-roshi who found in him the sort of devotion and concentration that he always hoped to find in American students. Reb was abbot of Zen Center for eight years, something like 1985 to 1993. 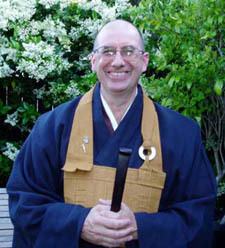 He is now called a senior dharma teacher and has many close disciples and students. I sent a message to his room through a nurse that said, "Get well soon Reb or I'll beat you up." And I'm sure he will get well and strong quickly and will continue being a strong dharma teacher for many people for many years to come and will continue to be one of the leading lights of the SFZC. His wife Rusa, daughter Thea, and dharma heir Fu Nancy Schroeder were with him at the hospital tonight and it is said that everyone, including Reb, were in good spirits. All prayers and healing thoughts and love and encouragement go out to Reb. And all our support and love to Rusa and Thea too. 10/08/99--Congratulations to Zentatsu Richard Baker-roshi and Princess Marie Louise von Baden upon their recent marriage in Germany. She is now Marie Louise Baker. I attended their wedding at her parents home, Sloss Salem (Salem Castle) on September 25th. They had already had a civil ceremony the week before. They are now living at Baker-roshi's center in southern Germany, Johanneshof. Reports from my trip to Germany can be found under Digressions. There's one more I want to write. I'll will also try to put more on this site about Johanneshof before long. When I was there, there were about a dozen people living there, and it had a wonderful calm zendo that seated many more than that for sesshin. It was gratifying to me to experience that Suzuki-roshi's dharma is thriving in this lovely area of Germany. Here in Sebastopol California, preparations are underway for a Traffic Accident Victim Awareness Day in honor of Mark Petchey, son of Grahame Petchey, an early disciple of Suzuki-roshi. It will take place on Saturday, October 9th, from 3 to 9PM in the downtown Sebastopol Plaza. There will be food, music, drumming, and a multi-media tribute to accident victims. Many local people, especially high school friends of Mark's are helping out. There will be an auction to raise money to help the Petchey family to care for Mark who will probably be coming home from a rehabilitation center next week. This event is co-sponsored by the Sebastopol Downtown Association and the Mark A. Petchey Trust. Event Info Line: 707-824-9733. Volunteers call: 707-824-4636. 10/05/99--The group of fires called Tassajara Fire by the US Forest Service never did reach Tassajara though they got close. To see the history of notes about them go to Tassajara Forest Fire. 9/17/99--Go to Tassajara Forest Fire for the latest on the situation there. All prior notes on the fire moved to that page. 9/16/99--Phillip Whalen is going to remain in Mt. Zion Hospital in SF convalescing for a while. He's just very feeble and needs more care than the SFZC can give right now. All our love and prayers Phillip. Gary Snyder mentioned in his recent message in Reader's Comments that an old friend of some of us, poet and mountain man Nanao Sakaki, is "out of touch right now, in the hospital in Shizuoka recovering from a fall where he broke a bone. But he'll be ok." Get well Nanao. 9/13/99--Phillip Whalen had to go back into the hospital. That's all I know. 9/10/99--Great news. I just got a message from Lew saying that he was "on an overnight furlough from the rehab center, after which I spend another week before being finally released. Then I will continue my healing from home. I am certainly well enuf to write this email. My disease was terribly serious, and nearly killed me, but I got past it and will now slowly but steadily recover." Philip Whalen is moving into the Zen Center to rehabilitate from his illness. Even though he lives next door to a hospice at the Hartford Street Zen Center, it will easier for him on the first floor at Page Street. Get well soon Philip. Mark is still gradually showing more responses indicating that he knows what's happening and is there. Our dear friend and teacher and poet and beautiful guy who's the chief priest of the Hartford Street Zendo in SF, Philip Whalen, is in the hospital. He was ill last week and had a couple of falls and is now in the hospital. Turned out he had a bacterial infection in his blood system. He's recovering but they want to keep him in a little longer both to recover more and to get some physical therapy to strengthen him. He's mostly blind now from glaucoma and told me he doesn't think he has long to go. I told him he's thought that since I met him in '72 and he said it's really true this time. Philip, a dharma heir of Zentatsu Baker-roshi, is truly loved by all and has been a voice of humor and reason throughout the years. We're all pluggin' for you Philip! Lew is doing much better. He has been talking to some close old friends on the phone and has walked. His trach tubes are coming out today. Everyday he gets better and everyone is very happy about how he's doing. Mark continues to progress slowly. His family says that the best way to describe his condition is that he's gradually waking up from his coma--responding some days and not others, but showing an overall improvement. 8/8/99--A message from Shohaku Okumura-sensei whom we are all happy is moving to SF. He's a fine Zen teacher, modest and on the ball. And he's done some important translating. AND he's going to be leading a zazen group at Sokoji, Suzuki's old temple in Japantown (not in the same building). Call 415-952-3286 for details. 8/10/99--Lew is much better. He's in rehab walking with help and has used a wheelchair with help. He's communicated by writing, has joked, and will have his tracheal tubes taken out very soon. Mark is also much better. His eyes are open when he's awake and he has responded with his eyes and squeezing and moving his hands and mouth when prompted by family AND by a doctor who said she now considers him out of a coma. After 100 days in rehab he's going to go home. He's moving a lot. It's hard to tell how much is what they call reflex and how much is intentional, but there definitely seems to be some intentional movement. Everyone involved is happy that both Lew and Mark are doing better than expected and we hope and pray they continue to heal and get better and better. 8/6/89--A report on Dan Harvey's funeral at Green Gulch from Kai (Harper). 8/5/99--Mark is out of intensive care. He's now in the neurology ward. He's still in a coma but is off of the respirator. His family is happy that he continues to show signs of progress. 7/31/99--A reminder: the memorial for Rick Fields (who died on June 6) will be at Spirit Rock in Marin County CA on Sunday August 1 at 2:00 PM. Parking is limited and people are asked to carpool. Obituary's from the SF Chronicle, LA Times, and NY Times can be found by clicking his name above. 7/30/99--Lew is doing lots better. He's out of intensive care in another wing of the hospital. Soon he's moving to a rehabilitation clinic in Kentfield. He can open his eyes, hold hands, can speak with difficulty but not much. He's even communicating with his family about business. People still can't visit him but he seems mainly to want to rest anyway. 7/29/99--The funeral for Dan Harvey will be at Green Gulch Farm on August 4th at 3:00 PM. 7/28/99--I was thinking that there's been so much sad news on here, and that I ought to put some good news on. So let me announce that Zentatsu Richard Baker-roshi is getting married on September 25 in Germany to a wonderful young German woman named Marie Louise. I've met her but I'm not sure about her last name because in the announcement her parents are listed as "The Margrave and Margravine of Boden." And, it says she's marrying Richard Dudley Baker. I'd forgotten about the Dudley. Anyway, congratulations to them both! 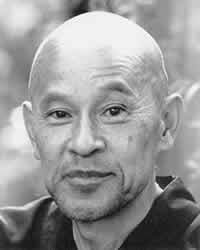 Lew , Suzuki-roshi disciple, is in the hospital in Marin Country CA since Tuesday 7/12 (approx.) with viral encephalitis. Mark Petchey, sixteen year old son of Grahame (and Hideko), one of Suzuki's earliest disciples, is in the hospital in Sonoma County CA since early Saturday 7/17, with severe head and lung injuries following an automobile accident in which the driver was killed. 7/28/00--Not much to report. Both are essentially the same with some small signs of improvement. 7/26/99--Some good news. Lew is out of his coma. He's responding consistently--moving his hands and mouth and eyes to communicate. He's focusing his eyes and recognizes people. The doctors are amazed. 7/25/99--What a strange and tragic co-incidence to have had two people so close to me suffer such similar fates (though we do not know what is to come in either case). Both Lew and Mark are still in comas with little change. Amy says that Lew is still in a coma but occasionally showing signs of awareness and giving her physical responses such as wiggling his toes or squeezing her hand. Mark continues to show no such signs except for occasional reflexive twitches of the lips or arm that the doctors dismiss. His father, with the help of his eldest son, is beginning to find what exists on the internet in way of information and assistance on this subject. The book, Coma, by Mindells I believe, has been recommended. Since it has been a week since the accident, Mark's doctors are not giving much hope for his awakening from his coma, but still, some of the nurses and technicians say not to let them make us give up hope, that they tend to present the worst-case scenario. The mother of the boy who died in Mark's accident, whose family has a number of members in the medical profession, says that there are legal reasons why the doctors take such an approach. So we are looking for positive avenues to go down--stories of recovery, methods of encouraging it. Thanks for all the kind and healing words and thoughts that have gone out to and for Lew and Mark. 7/23/99--Nothing really new to report. I haven't heard anything about Lew today, and Mark's doctors just say that he's the same. That's good in terms of living and bad in terms of getting out of his coma. But it's still too soon to say anything. Also, talking to some of the nurses and a respiratory technician, I got a much more positive feeling. Some of them will say never to give up hope and that they've seen lots of people come back from conditions like Marks. One nurse said that doctors tend to speak in terms closer to worst case, somewhat to protect themselves. Mark did look better to me yesterday. I read to him from Lew's book which I happened to have on me. 7/22/99--Lew's condition seems to be improving. People around him feel much more positive. He continues to respond more in small ways. Mark's condition hasn't changed. The situation there is grim but hopeful. He did cringe somewhat yesterday when given a shot and the doctor was pleased with that. We're just watching and waiting and sitting with him. They can make him cough, can get a gag response, he has slight movements, and the nurse liked it when he farted. 7/21/99 (1:15pm)--Amy has been meditating and visualizing while at Lew's side and talking to him about it so that he can do the same if he's able. A doctor in San Diego has been advising her. The idea as I've heard it is at least somewhat to get the virus to calm down and to get the liver to do its job in taking care of toxins. I hear he's breathing better, that his temperature is down but still high and swelling is down. 7/20/99 (10:30pm)--Little change. There is guarded optimism for both Lew and Mark They are both still in comas in critical yet stable condition. Lew opened his eyes last night when his wife Amy said good night, and it was said that one of his toes moved. Mark has shown faint signs of response such as gag reflex and is not getting worse. He is intact and doesn't look bad. His injuries are internal. In both cases, there is very little to report and the winds of hope and despair tend to blow one way or another depending on a phrase or two of the last doctor someone talked to. We have been encouraged not to speculate or be morbid, to continue our meditation, prayers, positive thoughts, visualization, and ritual, each as our beliefs guide us. 7/20/99--I got word this morning that Lew is better. But better for Lew meant that he was showing some signs of consciousness. It appeared there was blinking communication and it seemed he responded that he wanted to see the sunset last night. Mark is not yet showing signs of consciousness. His condition is not improving or changing. 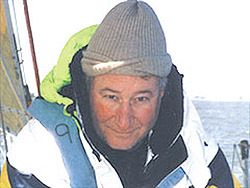 The cuke.com Sangha News section started off with reports on the conditions of Lew Richmond and Mark Petchey. Both of them almost died. (See directly above) Lew has pretty much fully recovered. You can read about his struggle and recovery in his book, Healing Lazerous. See Lew's books in the bibliography of this site. Lew's web site with links to his Zen group. Mark Petchey lived with severe brain damage. He has continued to improve incrementally through the years. Go to Mark Petchey page.